The other day I thought I must call Güner Pir and ask about his work, it is some time ago that he had his last exhibition. Usually it is all three or four years, that is the time it takes Güner to finish a painting project. And hardly had I finished thinking, the present invitation comes in. 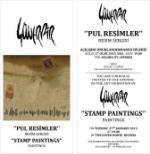 What an interesting title …history and stories on the basis of stamps, painted stamps, Cypriot past. Güner Pir does intensive research for all his projects, be it crime or prostitution or wedding ceremonies, always connected with symbols of a certain era and the most beautifully painted calligraphy. I will go to the opening evening and will bring back pictures for you to see. However to see paintings in the original is the true thing, a photo can never produce the same impression as a personally experienced one. The size and the brilliance of colour, you can go close and study the brush work. The exhibition is open daily except Saturdays and Sundays and viewing times are at official govenrmental office hours. 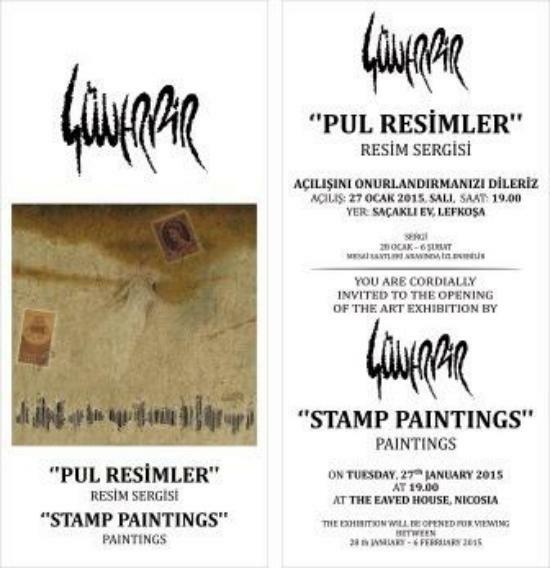 Please find hereunder my review of Güner Pir’s last exhibitions. If you want to see pictures you must go to my website. Güner Pir has chosen the ageing of time as the title of his exhibition; ageing as the process of centuries passing, the ‘skin’ of wood, the grain of wooden planks used for the manufacture of doors, Cypriot doors, and on these doors he has engraved the passing of time, the symbols of ages back, fertility symbols of the bronze ages, patterns of Cypriot window frames, the fragrant pattern of Lusignan architecture as a reflection. Reflections. These doors open up to show stories of our past. Güner Pir is painting on wood for the first time. It is symbolic. In this new exhibition after five years of intensive work, he will show us 27 paintings altogether, on door panels and on canvas. When Güner Pir had concluded his last exhibition “Bendolar” in 2007, he had some afterthoughts about the theme: Bendolar, the wedding gift a young woman received for her wedding, when women did not go out and earn their own living, it was their capital, their treasure, it gave them some independence and a security to her mind. We had intensively talked about the project. These afterthoughts are the binding element to his exhibition of today, of 2011. From here he goes to an important part of Cypriot history, not often talked about any more, that is the 2nd world war when Cypriots, Turkish and Greek alike, went to fight for the British, they were Cypriots then, brothers and friends and not enemies; on a memorial in Nicosia the Turkish and Greek names of the fallen soldiers can be found next to each other. Other stories of the past he has uncovered, crimes and political killings for which he had done a lot of research work, the official announcements and the clothes of that time are authentic. Also the sale of girls as slaves by the Cypriot families, and finally the emigration of Cypriots to London and other Commonwealth countries are landmarks in this exhibition. There is one series of paintings he calls ‘Verses’ touching me very much, which include poems by Neriman Cahit and Fikret Demirag, poets he admires, and so do I.
Güner Pir has stayed true to his principles, that is the high quality of canvas structure and the use of figures as transmitting media, his signature as he calls it himself; he had this wish to unroll and record his country’s historic events together with the values and symbols that go with them. Güner Pir was born in Paphos in 1949. He graduated from Gazi University in Ankara in 1972 and has since then held several solo exhibitions and has participated in many mixed local and international exhibitions. The exhibition at the Eaved House in Nicosia, will be opened on Friday, the 18th of November at 18.00 hrs. and is open for viewing from November 19 until November 25.
on Saturday from 10.00 - 13.00 hrs. I will report on the exhibition fully after the opening.